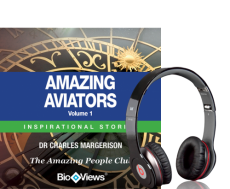 These inspirational audio stories from The Amazing People Club explore the lives of four individuals who each took personal risks to push the bounds of human possibility. Meet the enigmatic Amelia Earhart who felt drawn to the skies from an early age and was the first woman to be awarded the Distinguished Flying Cross. Discover the life story of the equally enigmatic Richard Pearse, who many claim was flying months before the Wright brothers took their maiden flight. Hear from the gutsy Amy Johnson who flew during WWII and was the first British woman to fly solo from Britain to Australia. Listen to Raymonde de Laroche, a French actress who became the first woman in the world to get her pilot’s license.